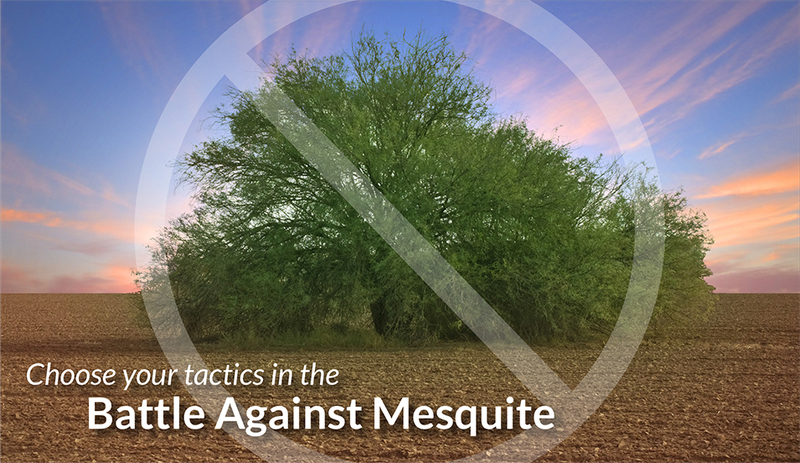 If you live south of the Canadian River, chances are you have struggled with mesquite management on your property. But with the invasive plant spreading north and east due to a variety of weather factors, you’re no longer alone, as mesquite can now be found causing headaches in Texas, New Mexico, Arizona, Colorado, Oklahoma, Kansas, California and Louisiana. Wherever you live, mesquite management can be accomplished in a variety of ways, with cut-stump and basal-bark applications leading the charge. A review of the area and its problem plants will best determine which method should be used. If you are cutting a single-stemmed tree, then the cut-stump treatment is the recommended application, particularly if the tree’s bark has started to wrinkle. Cut-stump treatment refers to treating the freshly cut stump with a herbicide labeled for mesquite control. The root collar area, sides of the stump and the outer portion of the cut surface are sprayed until wet, but not to the point of runoff. This application can be made at any time of the year, unless snow or water prevents the spray from reaching the ground line. Treatment on a cut stump is important as it will move through the remainder of the stump to the bud and prevent multiple stems from regrowing. The second method used to help control mesquite is a basal-bark treatment. This method includes applying herbicide to the smooth stems of the mesquite plant. The herbicide is sprayed 12” to 15” from the ground and up the stem, wetting the stem, but not allowing the herbicide to run off. This method is most effective on new growth, but it can be applied at any time, including the winter months, except when the snow or water prevent spraying to the ground line. Whichever method for mesquite management you choose, professionals stress that mesquite treatment is not a one-time application effort. It takes constant monitoring and treatment to keep the woody bush under control. The effort is worth it since properly managed mesquite can promote a healthy ecosystem for livestock grazing and wildlife habitat. BRUSHTOX™ a Ragan & Massey herbicide, treats mesquite and more than 60 other woody plants and 30 broadleaf weeds. BRUSHTOX contains triclopyr, an active ingredient in herbicides proven effective in controlling mesquite and other invasive woody species such as wild roses, Virginia creeper, sweetgum and oaks. BRUSHTOX can be applied using either cut-stump or basal-bark applications. It is easy to mix with diesel or with other pesticides.